Being the new kid can be difficult. Especially when you’re a toddler. For parents and kids alike, it can be difficult to adjust to childcare. The good news is, daycare can benefit you and your child greatly. With aspects of routine, social interaction, and academic advancement, daycare could be a great option for your family. The adjustment can take some time, but we have some great tips to get you off to the best start and help your child adjust to childcare. Before you send your little one off to a full day of childcare, take them to do walk-through of the center. Let them see the toys, play and nap areas, and drop-off station. Help them get acquainted with the teacher or child care provider, and stay for just a short time. With older children, talk through a hypothetical situation with them and do so positively. “Look, sweetie, this is the table you get to do crafts at!” or “Wow! You get your very own cubby hole and coat hook – that is awesome.” Let them get to know the people and location before you make any big commitments. Even before you arrive at the childcare center for a practice visit, start talking with your kids about the idea of daycare. With infants, this may seem silly, but it’s helpful to walk through as much of the coming transition as possible. Read books, ask questions, and build the excitement for all those benefits of daycare that we mentioned before: new friends, activities, and lots of time to learn new skills! If the idea of sending your child to daycare is especially stressful, try starting them off with just a day or two. Don’t feel like you have to start them Monday and just grit your teeth through a whole week of tough adjustments. Work with your daycare to set up an abbreviated first experience. At the end of that time, you can get a sense of your child’s response and adjust the next steps from there. Take it slowly, and know that you have freedom to change your mind if necessary! If you have toddlers or kids transitioning to preschool, this tip is especially helpful. And fun! Get your child ready for this next step by allowing them to help shop for a few school items. 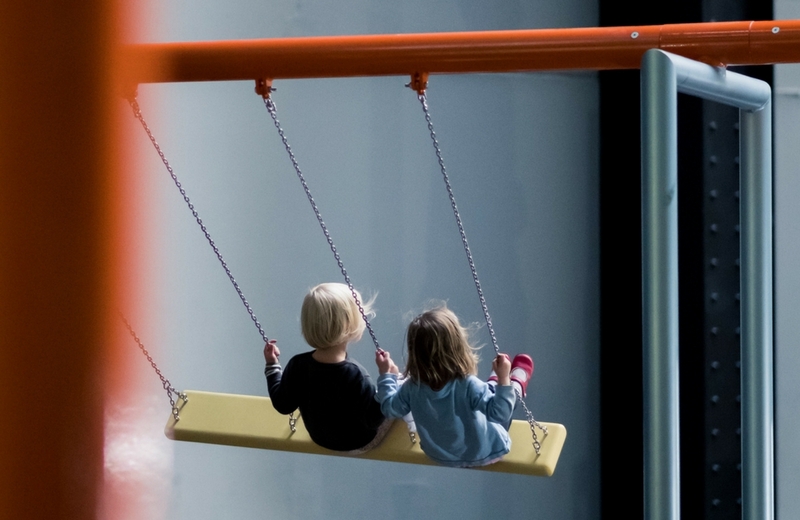 Yes, “school” might be a stretch for your two year old, but it can help make connections for them. Mommy and Daddy aren’t just leaving them for the day; they’re sending them off to school to learn lots of new things! You’ll want a backpack or bag or some kind, and if you’re clueless about how to pack a bag for daycare, check out this helpful list. Any transition takes a bit of relearning routines. 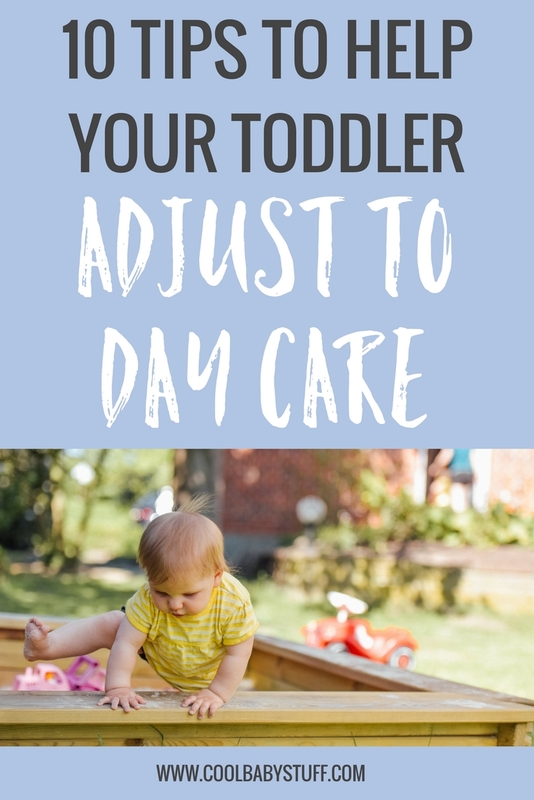 As you prepare for this adjustment to daycare, you’ll want to revisit some of the daily rituals in your home. For instance, as your child starts attending daycare regularly, you’ll want to fine tune (or start)any morning routine you have in place. You can customize something to fit your family or check out the ultimate school morning routine, and start each day off well. Other routines are can also help your toddler adjust to childcare. A goodbye routine is helpful, especially for hesitant children. Find a little saying to stick with every time you leave, or give three kisses on their cheek each time. Whatever you settle on, make it simple and consistent. An end-of-day routine will also set you up well. When you pick them up and take them home, you may find it helpful to do the same thing each time. Play “I Spy” on the way home or pretend you’re rocket ships as you move from the childcare center to the car. Again, it can be so simple, but find ways to give them regular signals of what’s coming next. To make the transition smoother, it’s helpful to send your child to daycare with a familiar item. So much will be new to them, and this gives them a bit of home while they make the big adjustment. Maybe it’s a stuffed animal, blanket, favorite water bottle, etc. Gradually, you can help them use the item just for nap or just for drop off, allowing them to make new connections. Sending your first child off to daycare can be difficult. You may have lots of anxiety and uncertainty, which is common. For the first week or so, take time to check in throughout the day. Call the center or childcare provider once or twice a day and get a short report of how the day’s going. You can discuss this arrangement with the daycare ahead of time, and most places are happy to help make the transition as seamless as possible. It’s already been said a couple times, but the daycare transition holds a lot of emotions. Your child will most likely experience the brunt of that emotion, but you should be prepared for the effect it’ll have on you. Leaving them for the first time may be difficult, and you may hold feelings of guilt. Know this: it doesn’t have to be forever. If childcare seems like a good option for your family, you will find a good fit and your child will be benefit greatly. While you (Dad or Mom) are adjusting, make sure to take care of yourself. Don’t let worry and guilt plague that first drop off experience. Kiss them goodbye, take a deep breath, and drive away to pick up your favorite pastry or coffee. Parenting is hard work. Keep doing your best, and caring for your kids. You’re doing great!